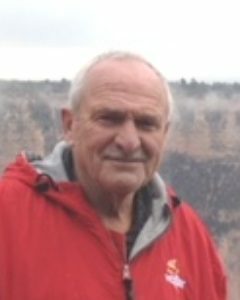 Michael Wendlandt, husband of JoAnn, age 69, of Stewart, Minnesota, passed away Sunday, November 4, 2018, at Mayo Clinic Hospital-Rochester, St. Mary’s Campus in Rochester, Minnesota. Memorial Services will be held on Thursday, November 8, 2018, at 11:00 A.M. at Christ Lutheran Church in Glencoe with interment in Evergreen Cemetery in Boon Lake Township, Renville County, Minnesota. Gathering of Family and Friends will be Wednesday, November 7, 2018, from 4:00 P.M.-7:00 P.M. at the Dobratz-Hantge Funeral Chapel in Hutchinson. A Prayer Service will be held at 6:00 P.M. on Wednesday. Visitation will continue one hour prior to the service at the church on Thursday. Military Honors by the Hutchinson Memorial Rifle Squad. Michael C. Wendlandt was born on August 23, 1949, in New Ulm, Minnesota. He was the son of Raymond and Lena (Riebe) Wendlandt. Michael was baptized as an infant, and was confirmed in his faith as a youth, both at St. Paul’s Lutheran Church in Stewart, Minnesota. He was a graduate of Stewart High School Class of 1968. Michael entered active military service in the United States Army on February 26, 1969, and served his country during the Vietnam War. He received the National Defense Service Medal, Good Conduct Medal, Republic of Vietnam Campaign Medal W/60, Vietnam Service Medal, and 2 Overseas Bars. Michael received honorable discharge on September 23, 1971, at Camp McCoy, WI, and achieved the rank of SP4. On July 25, 1973, Michael was united in marriage to JoAnn Wendlandt at Christ Lutheran Church in Glencoe. This marriage was blessed with three children, Erin, Laura and Michaela. Michael and JoAnn resided in Rural Stewart, Minnesota. They shared 45 years of marriage. Michael had a passion for farming his farm in Boon Lake Township. He was a past commander for VFW - Post 906 Charles Mc Laughlin in Hutchinson. He was also a member of Christ Lutheran Church in Glencoe. Michael was an avid outdoorsman; he enjoyed fishing, camping, hunting, and golfing. He had a special talent for woodworking. Michael especially enjoyed taking road trips with his family and friends. He was also a Les Kouba fan and collected his prints. Nieces, nephews, other relatives, and friends. Michael is preceded in death by his Parents, Raymond and Lena Wendlandt; Sister, Elvera Trettin; Father-In-Law, Laurence Oberlin. I am so sorry to hear about Mike. We just can’t believe it yet. You are in our thoughts and prayers. We’ll stop by when we get back for Christmas. Take care of yourself, and cherish all the memories. My thoughts and prayers are with you all, I went to school with Michael, My deepest sympathy.